Monday, May 12, 2014, our guide for the day, Will Setz first showed us the topography of the route we were going to take today. The so-called Derech haGav"- road of the back, runs all the way from Lebanon in the north to the Red Sea in the south. The high hills/mountains of this area form the biblical 'Heartland'. Here, God gave His people many promises. Beit El (Bethel)'s and Hebron's mountains are about 1.000 meters high, while Jerusalem lies at a height of 865 meter. Just after going through the military checkpoint at Pisgat Zeev, Will gave us a short explanation of the area that was given to the Biblical tribe of Benjamin. Jacob called his son a 'ravenous wolf', hence you'll find many road signs with a wolf. We were now 'behind' the wall which presently covers 60% of Israel, and protects its citizens against terror attacks. Geva Binyamin (the hill of Benjamin) is also called Adam (see Jozua 18:24). It is situated between the Arabic Jabah and Mikhmus (Geva and Michmas). At about 839 meter above sea level lies Gibeah (of Saul), Tel el-Ful (hill of beans) in Arabic. Gibeah was a very important city in Bible times. Judges 19-21 tells us the story of the Levite and his concubine. Israel's first king, Saul, ruled 38 years from Gibeah (1 Samuel 8:31). In the time of the divided Kingdom the city is mentioned by several prophets: Hosea 5:8-10; Isaiah 10:29). During the siege of Jerusalem in 70 AD the 10th Roman Legion camped here. Between 1948 and 1967 this area was in the hands of the Jordanians. On this spot, where king Saul had reigned, King Hussein began to build a summer palace. It was never completed, because Israel conquered the territory during the Six Day War. Not far from Gibeah, on the side of Road no. 437 we pass a stone wall called "Kubur Bani Yirsae'il" – "the graves of the Children of Israel", which are about 2000 years old. Archeologist and Bible scholars believe that the grave of Rachel is here, and not as supposed near Bethlehem. Genesis 35:19. Joshua 18:23 mentions the city Farah, also called Efrat (has the same Hebrew root). Because this town was situated in an area which had many barley and grain fields, it was called "Beit Lechem" – House of Bread. The Arabic name kept the Hebrew tradition alive. In the 19th century, this helped the archeologists to locate and find many original Biblical cities. Barren hills carry sound for long distances. That's why it is possible what Jeremiah describes in 31: 15 that the mourning for Rachel could be heard in Rama. Standing above the settlement of Migron We had a beautiful view over the area, in the direction of Michmash and read the story of Jonathan and his weapon bearer in 1 Samuel 10; 1 Samuel 13-14. The two stone teeth in the wadi are called Bozez (Philistine side) and Seneh (Israeli side). According to the Bible Migron was the area where Saul and his 600 soldiers pitched their tents before attacking the Philistines who were camped in Michmash (1 Samuel 14:2) with the dry riverbed (wadi) between them. God used Jonathan's seemingly suicidal mission to gain a great victory over the Philistines. On February 13 1918, British troops prepared to attack the Turks also camping at Michmash. The British army knew they would loose many man in this attack and that evening, Major Gilbert leafed through his Bible in search of a name that seemed to elude him. He found the story in 1 Samuel 13 en 14 and after reading it, he awoke General Watson to share the story with him. Figuring that the area had not changed much since Biblical times, the general sent out scouts. They found the pass, which was lightly guarded by the Turks.Instead of sending out a brigade, that night the general sent an infantry unit through the pass, between the stones of Bozez and Seneh, that overpowered the Turkish guards. The next day, presuming they were surrounded by many British soldiers, the Turkish soldiers panicked and ran away. A few thousand years later, Jonathan's tactic again proved successful. Deir Dibwan is translated with "the monastery of the Council". According to Will this was the place where the prophet Elisha, on his way to Bethel, was taunted by a group of children. "Bold head" they called him. 2 Kings 2:23. (Because Elisha cursed the children, two bears mauled 42 of them. Deir Dibwan (Doobee = bear in Hebrew) – the monastery of the two bears – that seems more plausible. Mizpah/mitzpeh is a watch tower. We saw several spread in the countryside. In Biblical times families lived in them during the harvest season. They also had a military function when part of a city wall. Road no. 465 is also called the Trans-Samarian Highway. 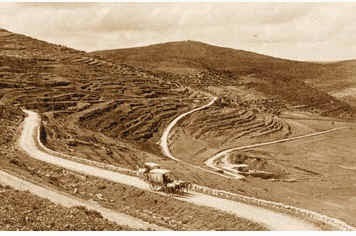 This ancient road from Shechem (Nablus) to Jerusalem has become much better compared to the picture taken in 1911! Ma'aleh Levonah means "the ascent of the frankincense". The area was known for its bushes giving off white fragrant resin. 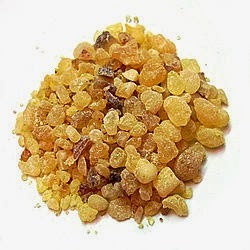 This was used as frankincense in the Tabernacle in Shiloh, not far from there. In Judges 21:29 we read about a village with that name. The Arabic village still carries the same name: Al-Lubban ash-Sharqiya (east Levonah). On our way to Mt. Gerizim (near Shechem) we drove through a long village called Huwara. It was well known because of its excellent car mechanics. Before the Intifada (uprising) these Arabs used to work in Shechem (Nablus). When business closed (due to the many terror attacks) these mechanics opened their own car repair shops in Huwara – with great success! Passing a water pipe shop, Will honked his horn. "On our way back we'll pay a visit to my friend," he told us. Today, the Tappuach junction is freely accessible. During the Intifada it looked like a military stronghold with many security measures to protect Israelis against the constant terror attacks. Kfar Tappuach is a village near this biggest central junction in Israel. From this point one can travel through all parts of the country. Joshua 12:4 speaks about a village Tappuach (Apple). 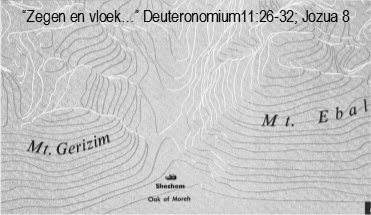 The fields belonged to the tribe of Menashe, but the village belonged to Ephraim. It lies on the Road of the Patriarchs, which Abraham, Isaac and Jacob travelled on their journey south. Via the Jewish village Beit Bracha (House of Blessing) we ascended a steep road up to Mt. Gerizim (Jebel et-Tor). This for the Samaritans holy mountain is the home fora bout 376 Samaritans, the rest of the group live in Holon, near Tel Aviv. Opposite Mt. Gerizim (886 meters) lies Mt. Ebal (938 meters), with Shechem (Nablus) in between. The Canaanite /Israelite city was called Tel Balata – now a notorious refuge camp. Moses told the people of Israel to bless Mt. Gerizim and curse Mt. Ebal. "Flavia Neapolis". Because no one could pronounce it, the people called it "Nablus". Overlooking the city of Shechem stood a house like a palace. Will told us it was built by an Arab who had become very rich from helping the Americans during the Gulf War. He created beautiful gardens and imported marble from Italy and Greece to decorate his palace. On our way down hill we passed through the Samaritan town, and took time for a photo shoot with some women and their children. Passing by a natural spring, we had another quick opportunity to take some photos - it's so beautiful there! Around 2 p.m. Will's friend in Huwara welcomed us with Arab hospitality – freshly brewed sweet coffee. His road side water pipe shop didn't receive many customers, but he enjoyed our visit. It was a real 'cultural experience' to use the toilet above the shop and having to climb stairs that were lacking a railing. Shilo (Tel Shiloh) is situated on a fertile valley in South Samaria, on the "Road of the Patriarchs". The valley is the geographical border between Judah and Samaria. In Biblical times, for 369 years Shilo was the spiritual and administrative center of the Jewish people. Joshua 18:1 tells the story how he cast the lot for the different tribes. In this place the Tabernacle stood, and Hannah prayed for a son. (1 Samuel 1:3). Will showed us around the archeological dig, we read different Scripture passages and watched a movie about the area. The Aramaic text doesn't say "Shiloh" but "Mashiach" – anointed. In the Byzantine period (about 1700 years ago), 4 Christian churches were build in and around Tel Shiloh. During excavations in 2006, beautiful mosaics were discovered – the most unique one (for a church) was a Star of David. Road no. 437 brought us back to Jerusalem, where we arrived around 5 p.m. It had been an unforgettable day. We had so much to ponder about. And check our agendas when we could plan another trip with Will – to Hebron!